This is a future tense, fortune telling board game. Students take turns rolling the dice and moving their tokens. When they land on a space, they must ask the question “Will I ~” + the phrase written on the space. If they don’t ask the question, they must remain on that space. If they do ask the question, they roll the dice again to divine the answer to their question. If the die turns up 1 or 2, that means the answer is “yes,” and the student gets to move three places forward. If the die turns up 3 or 4, that means the answer is “probably”, and the student gets to move forward two spaces. If the die turns up 5 or 6, the answer is “no”, but because the student used English, he gets to move forward one space. The first student to reach the goal wins. While playing the game, you could have the students mark down the questions they ask, and the answers they divine from rolling the die. 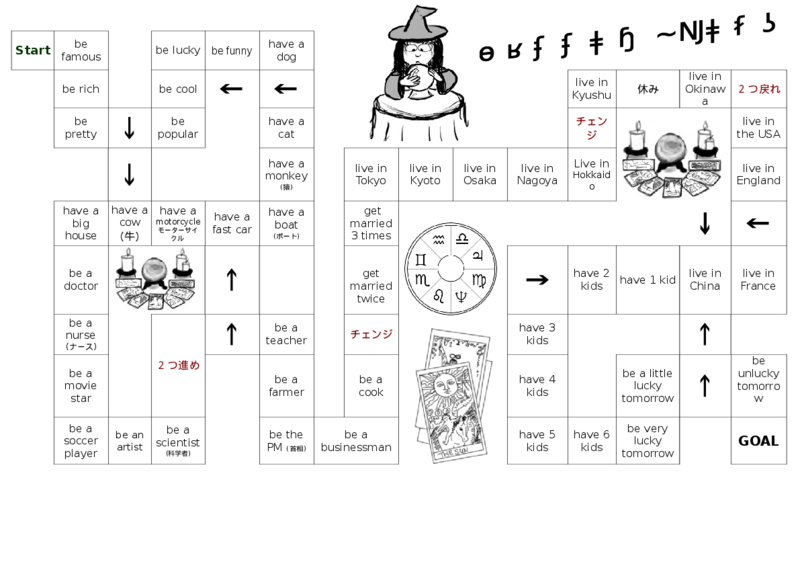 When the students finish the activity, you can have them write down their fortunes using those sentences, and then have the students read them aloud to the class. Maybe you could vote on the best fortune or something.